For millennia, tea has provided great health benefits, and oolong is no different. One of the widely recognized oolong tea benefits is its ability to aid weight loss. A claim that is scientifically proven and supported, as a result of regularly drinking oolong tea. All tea contains caffeine. One huge advantage of oolong is that it contains less caffeine than black tea. Oolong is packed full with beneficial fluoride, theanine flavonoids and amino acids renowned for counteracting the anxious jitters often associated with the consumption of caffeine. But this doesn’t inhibit oolong’s ability to sharpen focus and fight fatigue. 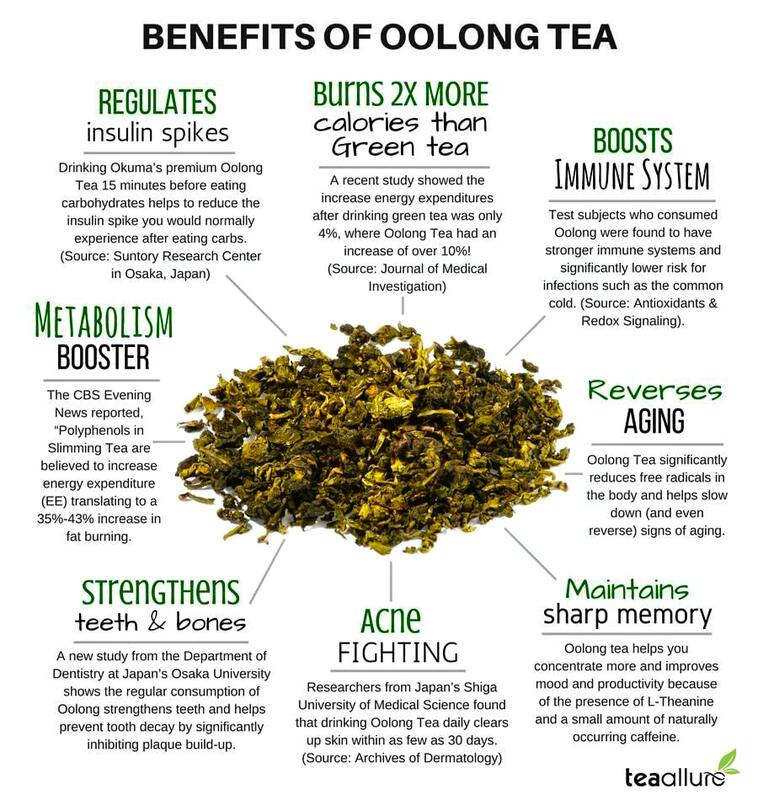 The list of the health benefits attributed to oolong is long and constantly growing. Oolong has been associated with the prevention of diabetes, low instances of obesity, heart disease and cancer. It can help with the reduction of oxidative stress and inflammation, an increase in cognitive performance. It promotes healthy bones and healthy skin, too. Of course, the medicinal properties of tea were widely known and accepted in the East. In recent years, however, the health benefits of teas have prompted scientific studies in the West, albeit focused mainly on black tea. But this is hardly surprising. The consumption of black tea accounts for 78% of the tea worldwide, with green tea at 20% and oolong tea garnering a mere 2%. Research carried out into the impact oolong tea consumption can have on our health and well-being are well documented. They are widely acknowledged in today’s modern health professions. In recent years, oolong tea has been the center of discussion and research concerning its ability to aid weight loss and fight obesity. Drinking oolong tea has been proven to increase and maintain metabolic levels by causing the body to produce more heat. This heat-creating process is called thermogenesis. It is crucial for people who aspire to lose weight. The process of shedding unwanted pounds decreases their metabolic rate. Oolong tea benefits the body by acting as a calming, metabolic stabilizer. Regular consumption of oolong tea also suppresses the body’s production of fat cells and helps the body burn fat at a higher rate. Oolong tea protects against obesity in the long run. Still, helps short term weight loss. The tea also promotes a reduction in inflammation, another contributor to stubborn weight. Of course, drinking oolong tea alone will not make you lose weight. But with exercise, sufficient sleep and a balanced diet, oolong tea can bolster your weight loss efforts and produce quicker results. The polymerized polyphenols in oolong tea also increase the metabolic rate, which can lead to effective weight loss. This happens because the polyphenol molecule activates the enzyme lipase. It is known to cause a reduction in LDL cholesterol. Another interesting result of drinking oolong tea is that by maintaining blood sugar levels steady, it reduces overall hunger and food cravings. Oolong tea improves digestion, another factor in maintaining healthy body weight. It is also calorie-free, which makes it a superb beverage to add to your weight-loss routine. In fact, if you drink it before exercising or working out, oolong can give you an extra boost of energy. It help you burn even more calories, too. Oolong tea’s ability to block the absorption of fats and carbohydrates is thought to play a crucial role in its weight reducing benefits. It is true that more research needs to be done in this area. However, first studies indicate that oolong tea indeed does have a powerful absorption-blocking ability. Oolong tea is rich in anti-oxidants, even more than green tea. Antioxidants help us stay youthful, both inside and outside. As long as your oolong tea drinking habits remain consistent, then your body will continue to enjoy its beneficial effects. Due to its high antioxidant content, oolong tea helps burn body fat more efficiently. At the same time, it strengthens the immune system. The caffeine in oolong is also known to work effectively with the EGCG (Epigallocatechin gallate) to help the burning of overall body fat. We’ve already mentioned that the oolong tea contains polymerized polyphenols. As a matter of fact, polyphenols lower cholesterol levels. They also cut back the overall absorption of fat in the body. Consuming oolong tea on a regular basis can help reduce cholesterol levels, lower blood pressure and improve cardiovascular health. A study carried out on over 76,000 adults observed something quite interesting. It turns out that the daily consumption of one or more cups of oolong tea could help reduce mortality rates from cardiovascular disease by almost 61%. A further study suggested that, when consumed daily for a period of 30-days, oolong tea helps lower blood sugar in people with Type II diabetes. Studies show that oolong tea contains antioxidants that help relieve eczema. Antioxidants in the tea might help to treat blemishes, acne, aging signs and wrinkles (age spots). This is why oolong tea can give skin a youthful, radiant appearance. Daily oolong tea consumption helps fight stress and anxiety. It promotes mental focus and performance, which makes it an ideal tea for students sitting their exams. Oolong tea prevents osteoporosis by building stronger bones. Unlike normal caffeine, the caffeine in oolong tea does not ‘eat up’ calcium in the body. This is one of the surprising healthy advantages of oolong tea. Quite the contrary, oolong tea helps in fixing the calcium derived from food, thereby making bones healthier and stronger. Oolong tea reduces the levels of inflammation even more than green tea can. This anti-inflammatory effect helps prevent cardiovascular diseases and promotes longevity. It even helps prevent degenerative diseases and arthritis. Oolong tea has been found to contain anti-cancer properties which are scientifically proven and backed up. Oolong’s anti-tumor properties thrive inside the human body, boosting the immune system with every single cup. Both green tea and oolong tea have been shown to have a positive impact on our health and well-being. But in most cases, it is the oolong which shines brighter than its green cousin. The claim that oolong tea can help lose weight and keep it off is nothing new. The Chinese people have believed this for centuries. One Chinese study involving 102 female test subjects was carried out in 1998. It showed that six weeks continuous consumption of oolong tea resulted in a reduction of body weight. The study prompted further research. It raised questions regarding the other compounds that were thought to have contributed to the oolong’s weight loss properties. The belief that oolong tea can be used to control body weight was again held under the microscope. The research was done by the American physiologist Dr William Rumpler of the US Agriculture Research Services’ Diet and Human Laboratory in 2001. Rumpler’s study examined how tea influenced energy expenditure (EE). It included 12 male volunteers who over three consecutive days were given four separate beverage formulas. The beverage formulas were full strength oolong tea, half strength oolong tea, caffeinated water and non-caffeinated water. When the participants’ 24 hour EE was measured, results showed levels were about 3% higher when they drank the full strength oolong tea. They also burned an average of 67 more calories per day. Fat oxidation (fat burning) increased by an incredible 12% after consumption of the full strength oolong tea. The research confirmed that a component other than caffeine is responsible for promoting the body’s preferred use of fat as an energy source. Following Rumpler’s study, other scientists began to speculate that caffeine combined with EGCGs joined forces to increase fat oxidation. In 2003, a Japanese study went one step further. It compared the benefits of oolong tea vs. green tea in the reduction of body weight. The participants, eleven young and healthy female students, received three different beverage formulas, oolong tea, powdered green tea leaves and water. Oolong tea was found to cause higher EE levels from beginning to end, at interval of every 30 minutes. EE levels topped at 90 minutes for both oolong and green tea and held their respective levels for around two hours. The results indicated that after consuming oolong tea, you would be able to expend more energy than if you were to drink green tea or water. This effect is sustained for up to two hours. Caffeine, catechins and other polyphenols were also measured, with exciting results. The caffeine and EGCG content, for example, was found to be much higher in green tea. 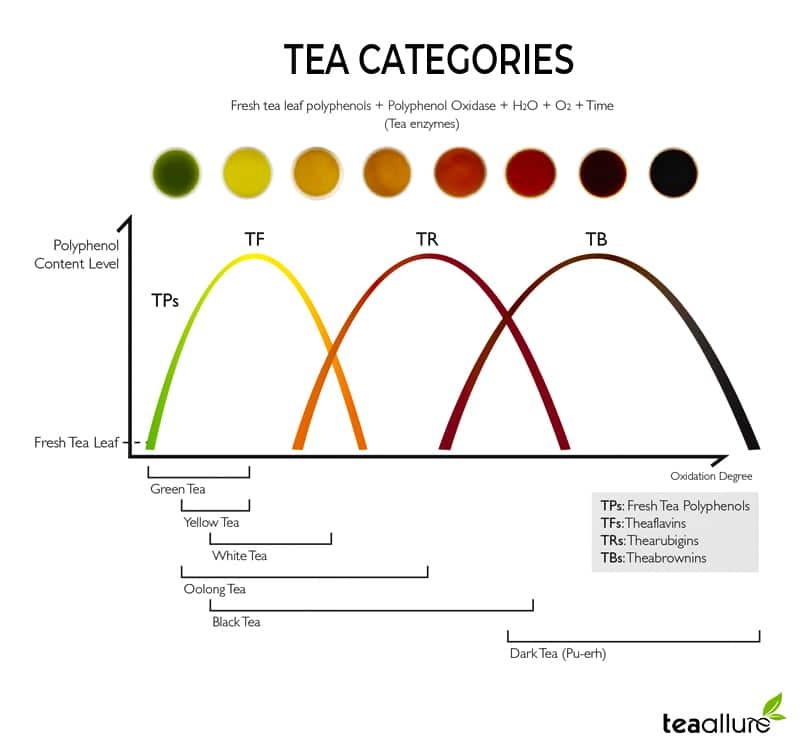 However, the concentration of polymerized polyphenols in oolong tea was significantly higher. Science tells polymerized polyphenol (substantial in oolong tea) is the key to tea’s fat burning properties. Not only the caffeine or the combination of EGCG’s and caffeine, as once thought. Plus, the remaining compounds in the teas were found to be equal. At least similar, with no marked differences. A find that greatly strengthened the results.